There’s a special feeling that comes when people get a chance to celebrate life’s many milestones, and very few can compare to celebrating babies first Christmas. However, it can be confusing trying to capture the event in the perfect way, especially for those on a budget. There are arguments about creating far too many celebrations for very young children, both from an economical and practical perspective. Many say that since babies are very unlikely to remember an event that occurred so early in their life, it wouldn’t be very beneficial to build an event like Christmas around children. But it’s entirely because young children are unable to remember details that parents need to take the initiative to commemorate things for them. While milestones are indeed built around individual people and events, the people who were there to celebrate are just as much an integral component. Try to capture their first Christmas not just for them, but for everyone as a family. Planning the Right Sized Party Celebrating doesn’t need to be an extremely ostentatious affair. It’s actually better to try to create a smaller, more intimate event so that your young one won’t feel pressured or scared. 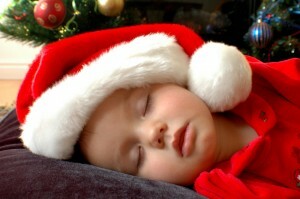 BabyCenter.com also suggests planning the party around their naptime, and to keep it around an hour in length. In this age, it’s highly unlikely that they’ll be very receptive to a party that lasts any longer and it won’t be fun for you, your child, or your guests when baby starts to cry. However, when it comes to buying gifts for your wee one this holiday season, it might be better to forego toys and go the more practical or ethical route. A report on Business Green indicates that the M&S Kids line of clothing will be the first product line to be pushed towards being fully traceable and sustainable. For those looking to shop for a new wardrobe for their baby and children, this is a great way to mark this milestone while dressing conscientiously.